RealDolls will soon be able to communicate with their partners. 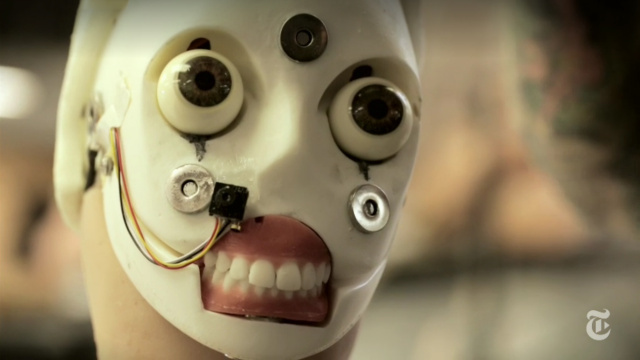 After years of selling the most realistic and popular silicone dolls, the company is developing interchangeable robotic heads which will be able to move and communicate. RealDoll CEO Matt McMullen says the update will hopefully be able to "arouse someone on an emotional, intellectual level, beyond the physical." McMullen says that although the dolls have fully poseable silicone bodies and have ove 5,000 have been sold, technology has advanced enough for them to warrant a real update. RealDoll will be teaming up with Hanson Robotics to develop the interchangeable heads, and talks with Oculus Rift have been under way to create a virtual reality connection to the dolls while partners are apart. The new robotic heads, slated for release in two years, will reportedly be priced at $10,000, and existing RealDoll owners can replace a static head with a robotic one. Fully robotic bodies will be developed thereafter and will be priced between $30,000-$60,000. According to McMullen, it is important the new generation of dolls, or Realbotix, can intellectually interact with their human partner without breaking the RealDoll experience. For example, some dangers of primitive AI can cause the dolls to say non-sequitors during intimate interactions, which for many breaks the illusion of intimacy. He hopes that partners can develop a real connection to their love doll, and appreciate their character. Certainly advances in artificial intelligence could make this desire into a reality in the near future.